The We are Robin covers have all been exceptional in their stylistic colouring techniques. If you are familiar with Bermejo then you will appreciate his very textured shading style, which you may notice with Batgirl’s face and hair. This means the colouring has to deal with the lack of blank spaces and the darkness of the pencilling. Perhaps this is why the colouring seems to be done by Lee himself. But it has also allowed him the opportunity to vary his aesthetic as there are times where the colouring is deep and contextual and when just the colours and outlines produce the effect. Before delving into examples of this, it must be noted how well composed this image is. It has a classic appearance of a hero and his ward leaping off a building with the cityscape in the backdrop. 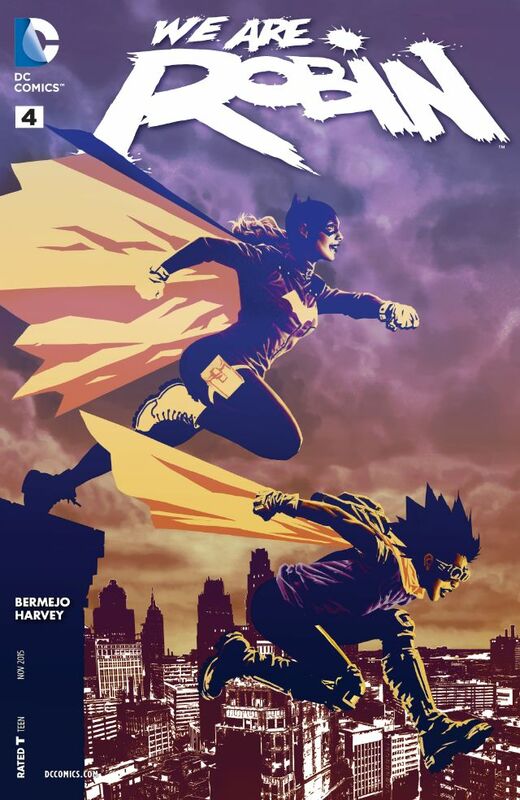 This is probably a homage to a Batman cover of days gone by with Batgirl upright and elegant but Robin leaping exuberantly headfirst. The light is clearly heading towards them as their costumes and facial features have a glorious yellow tint to the deep purples. As you look towards their feel and capes there is a refinement to base outlines. The boots and capes are just a single colour with a purple or black outline. I particularly like the contrast of having only two shades of yellow with the capes. It is implies a very modern pop like aesthetic and it blends wonderfully with Bermejo’s normal style. In fact the whole page is an exemplary example of colour effects as the theme is certainly one of yellow and purple. You can appreciate the wide ranging set of skills utilised in just using two colours: The blending of the setting sun into purples and yellows, the deep textures of the characters’s expressions and the simple yellows of the capes. These three examples combine to bring a gorgeous example of how to colour a page.